At the very beginning of the Stradun we find the Franciscan Monastery complex. 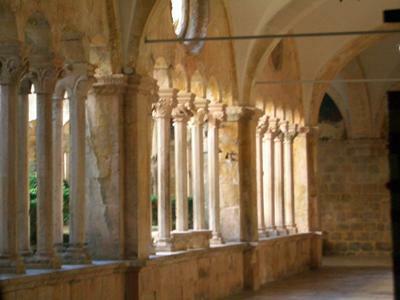 Its construction began in the 14th century and within its walls is one of Dubrovnik's most beautiful cloisters. The monastery has since 1317 had its own pharmacy, still functioning today and the third oldest in Europe. The Franciscan Monastery boasts one of the best-stocked old libraries, very valuable and highly regarded the world over.